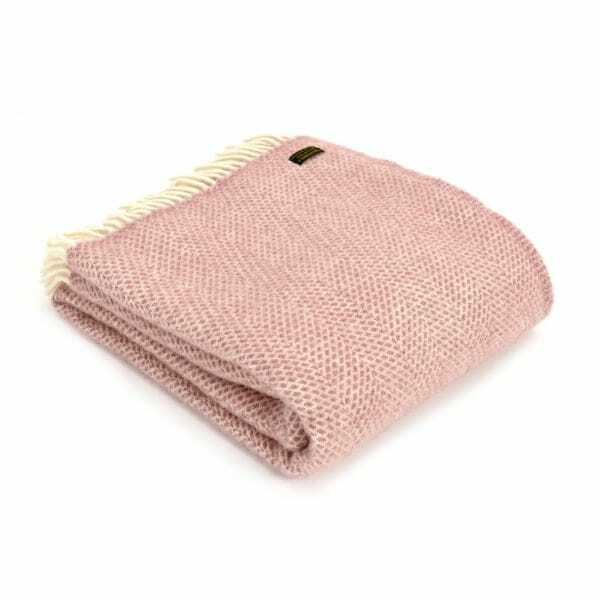 Beautiful and luxurious, this Beehive Dusky Pink Throw by Tweedmill is perfect for adding colour, comfort and style to your home. A lovely blanket made in Great Britain from 100% pure new wool using premium quality yarns, it would be ideal for keeping you warm and cosy and for draping over sofas, beds or chairs. The Tweedmill throw also makes a great picnic blanket for outdoor use during the warmer seasons. Showing our 2 Tweedmill Pure New Wool Beehive Throw Blanket Dusky Pink reviews with an average rating of Excellent. Would you like to write a review? I bought this throw to use over my bed as it matches the colours of my bedding perfectly! It is so thick and warm (so will remain at the bottom of my bed until Autumn) and it is very well made! I am so pleased with it! Review - Gorgeous colour, goes beautifully in my white and grey living room adding a touch of warmth. Far cheaper than in other shops, delivered promptly. Extremely pleased! Gorgeous colour, goes beautifully in my white and grey living room adding a touch of warmth. Far cheaper than in other shops, delivered promptly. Extremely pleased!